In the summer of 1981, a young British stylist who'd worked at Harper's Bazaar and Savvy landed at New York Magazine. 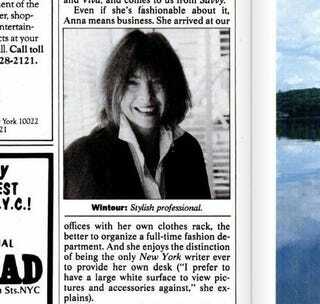 Her job was fashion editor; her name was Anna Wintour. Peep that staff portrait! In addition to mentioning that Wintour arrived at the magazine with her own desk, New York also notes that in the fortnight their new editor has been on the job, she hasn't appeared in the same outfit twice. Wintour's first fashion spread for New York starred a young Andie MacDowell posing on a Midtown rooftop in a Rietveld Red Blue chair. Reader response to Wintour and her aesthetic was mixed. It took Wintour all of until August 24 to run a spread that linked higher quality pieces with higher prices. "Investing In The Best" advises that "The right looks are also more costly, but well worth it." And they're still pulling that 'investment pieces' line on us now! For the May 3, 1982, issue, Wintour ran a spread called "Wait Until Dark." It was shot by Lothar Schmidt on location at Danceteria. But one of the best reasons to trawl through New York's digitized archives is to search, in these spreads, for the headwaters of Wintour's aesthetic. Am I alone in drawing a visual parallel between "Wait Until Dark," and a story for U.S. Vogue's September, 2007, issue, featuring Shalom Harlow? The later spread, photographed by Steven Klein, even has the same men's wear theme. In the February 28, 1983, issue, the cover fashion story "Metropolitan Life" features this shot of model Jennifer Rubin at Sloan's supermarket. 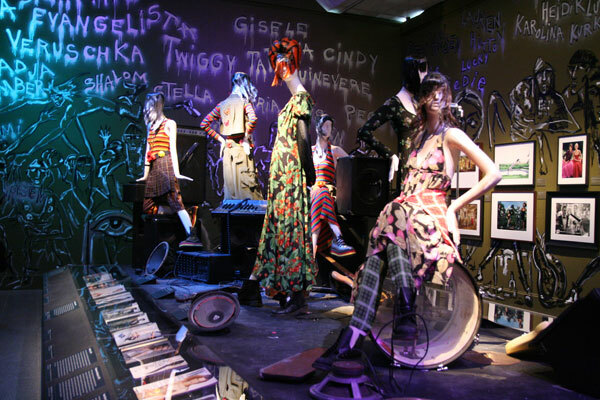 Vogue Paris used the Morton Williams on E. 23rd St. as a setting for its own editorial about surreal suburban malaise in October, 2007. And in fact it was that editorial, by Steven Klein, that I always assumed was the inspiration for American Vogue's tamer, Steven Meisel-shot, supermarket editorial of one year later. But maybe all this time Wintour was hearkening back to the winter of '83? Predictably, Wintour's love for fur blossomed early. This story, entitled "Furs For All Seasons," is from September 14, 1981. Wintour touts this "sheared-rabbit blouson that reverses to a rain jacket." It's by this designer, maybe you have heard of him, Karl Lagerfeld? Amazingly, in 1981 a Fendi "beaver coat with squirrel necks and mole" only ran $8,250. That seems like a steal given the $64,300 gold-dipped Fendi fur coat that Vogue featured in its September, 2008, issue. This editorial does take care to point out that "None of the furs shown is on the endangered species list." So while Anna Wintour might judge you for your egret-feather hat, she thinks rabbits are fair game. Good to know. Wintour shot a 25-year-old Ines de la Fressange for a story about what models wear on their own time. Her famous Anglophilia definitely shows in the spread: two of the five models pictured are British, and a third, Wintour points out, shops at an L.A. store that specializes in "English rock'n'roll clothes." I searched, valiantly, for a picture of a model pulling some daft pose while jumping, since that's pretty much all that Vogue publishes under Wintour's watch today. This shot from an April 4, 1983, story about British fashion designers was as close as I could get. Eureka! The definitive inspiration for the terrible graffiti Wintour made Julian d'Ys paint on the walls of the Met. As for this editorial, from the December 13, 1982, issue, I've got no snark. It's actually kind of beautiful — the spread has a simplicity that's entirely missing from the sterile, massively airbrushed set pieces of American Vogue today.